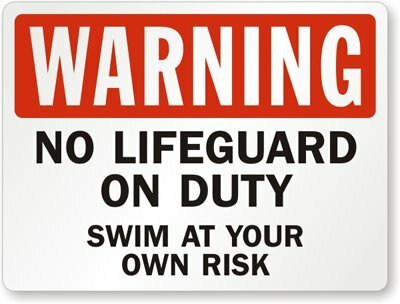 Warning, No Lifeguard On Duty Swim At Your Own Risk Sign, 24" x 18"
Warning, No Lifeguard On Duty Swim At Your Own Risk - Heavy-Duty Aluminum Sign, 80 mil, 24" x 18" - Keep swimmers updated with the lifeguard's status with a Swim At Your Own Risk Swimming Pool Sign. If you have any questions about this product by SwimmingPoolSigns, contact us by completing and submitting the form below. If you are looking for a specif part number, please include it with your message. No Lifeguard is On Duty Swim At Your Own Risk, Children Under The Age of 15 May Not Sign, 24" x 18"
Notice: No Lifeguard On Duty, All Children Under 14 Years Of Age Must Be Accompanied Sign, 10" x 7"
No Lifeguard On Duty Sign, 10" x 10"
Caution: No Lifeguard On Duty, Swim At Own Risk (with Graphic) Sign, 18" x 12"
No Lifeguard On Duty Swim At Your Own Risk Sign, 18" x 12"
Notice: No Lifeguard On Duty, All Children Under 14 Years Of Age Must Be Sign, 18" x 12"